We're all familiar with the stereotypical attributes used to characterize hockey players; missing teeth, scars on their faces and black eyes. Of course, these types of generalizations are often somewhat exaggerated, but there's still enough evidence to substantiate the ridiculous depictions we've all seen. If you don't want to end up with the face of a goon, we highly recommend that you wear proper protection for your face. Hockey facial protection comes in a few different forms, each of which is attached to your hockey helmet. 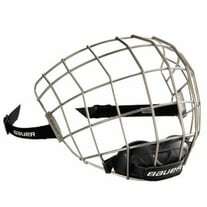 First, there's the full cage, which is the most common form of facial protection for amateur hockey players. Next, there's the full shield, which is a plastic visor that covers the eyes and mouth with breathable holes at the bottom of the mask. Last, you have the half shield or visor, which is an option for players over the age of 18 in leagues that do not require full facial protection. There are pros and cons to each type of face protection for hockey players. When it comes down to it, your choice of cage, shield or half visor is a matter of preference, so don't just take someone else's word for it – see for yourself. Here are some factors to consider when you're deciding which type of face protection to wear while you play hockey. Hockey Cages offer full coverage, great ventilation and high durability. 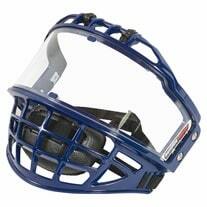 Cages are also very affordable, require little to no maintenance and last longer than full shields and visors. But, some players find the wires of the cage distracting. If you feel the same way then you should consider a full shield. Full Shields provide full coverage and high visibility. Shields offer the same amount of protection as cages without the distracting wires in your line of sight. The downside to using a full shield is that they have a tendency to fog up if you're playing in a warm rink or if you haven't applied an antifog solution to the surface of the shield. There's also a bit more maintenance involved with a full shield than with a cage. Many shields come with an antiscratch coating to improve durability, but the simple truth is that cages last longer than shields. Half Shields are designed to offer protection to the top half of your face, namely the eyes, nose and cheekbones. Your vision will be least inhibited with a half shield, second only to wearing no face protection at all. Half visors don't cover the mouth so they fog up less often than full shields. On the flip side, the durability of a half shield is comparable to that of a full shield, but many half shields are more flexible and therefore less durable and protective than full shields. Also, of course, since the half shield does not cover your mouth, jaw, chin and often the bottom of the nose, you're much more susceptible to facial injuries than you would be if you chose to wear a full shield or cage. Our hockey visors, cages and shields are made by the best manufacturers in the hockey industry. 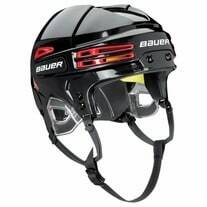 We carry hockey helmets and face protection products from Reebok, Bauer, CCM, Easton, Oakley and others. 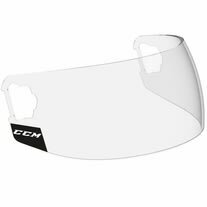 If you need help finding the right visor, cage or shield, please feel free to call us today and ask for a recommendation from one of our hockey experts in customer service.